^^ Unless it's freezing outside, these are my GO-TO to wear during travel. Birkenstock's form to your feet and have the BEST arch support. There's no pair better for walking in! Mine are the Arizona in color "Metallic Copper". Obviously, sneakers and shoes that you put on and say "WOW I could wear these all day!" are ideal for traveling! These Nike Juvenate (#2) sneakers are my favorite, most comfy pair of sneakers I own. Everyone is different and has a different pair of sneakers that are pure comfort, but I highly recommend these! They're my favorite walking/running shoes - I'm my best tourist self in these babes! ;) That being said, (I know, you guys hear me say this ALL the time!) I wore these white Converse (#6) ALL throughout Italy last summer. I walked the streets of Naples, Sorrento and Sicily in them and they're my tried and true go-to! They're ridiculously comfortable and they come in so. many. colors! These velvet loafer slip-ons (#4) make my list because they have a bit of an arch; I haven't walked a ton in these yet, but they are pretty comfortable so far! #1 and #5 are less traditional sneakers, but they're both extremely great walking options! They're like nontraditional sneakers, ha! My favorites for the two polar opposites - boots for winter trips and sandals for summer trips! 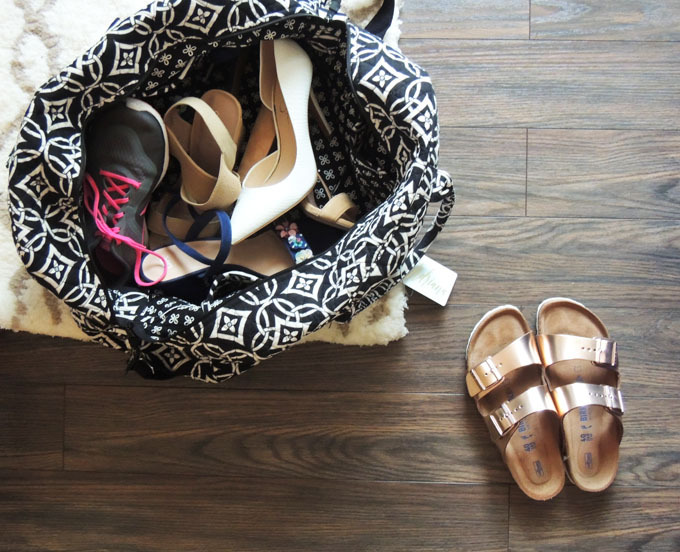 Winter shoe options are definitely harder (and heavier) to pack, but summer sandals can be difficult to pack too. As for my favorite boots, you can't go wrong with UGGs! I don't care how much they remind me of my middle school self, I'll always love them. ;) These UGGs (#1) are a fun take on the Classics, and they come in 4 different colors - I love them in chestnut! As for a boot that can be dressed up, down and worn with literally EVERYTHING, you cannot go wrong with these Sam Edelman booties (#2). They're THE most comfortable pair you'll ever wear! There's two other colors also - and for obvious reasons, booties are MUCH easier to pack than tall boots. These are similar to the Converse I mentioned - you'll be able to wear them ALL day with no problem! I've found that traveling with a pair of rain boots is so helpful and SO important, especially in cooler months/climates! A lot of rain boots I've tried on in the past are too firm and uncomfortable; these black matte booties (#4) are easy to walk in and again, easier to pack than regular boots. I love them and they're only $54! These are my top three sandal options to travel with - these block heels (#3), super comfy rose gold Birkenstocks (#5) and surprisingly comfortable Tory Burch packable sandals. 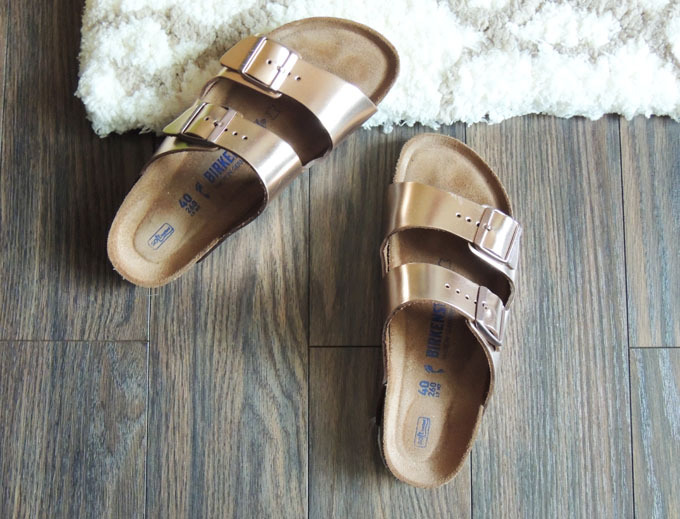 You can't go wrong with Birkenstock (especially when they're rose gold! ), everyone needs a great pair of block heels (SO much better than stiletto heel, both for packing purposes and comfort) and the Tory packables - pure genius. Honestly I wasn't sure how I felt about them, but you can wear them with the strap in the back or moved to the front and they come in 6 colors! They're great to pack in a bag without taking up much room, and these are great for dressing up or down also. A lot of these overlap with other categories I've mentioned, but these five picks are SUPER easy to pack - some go as far as literally folding in half! 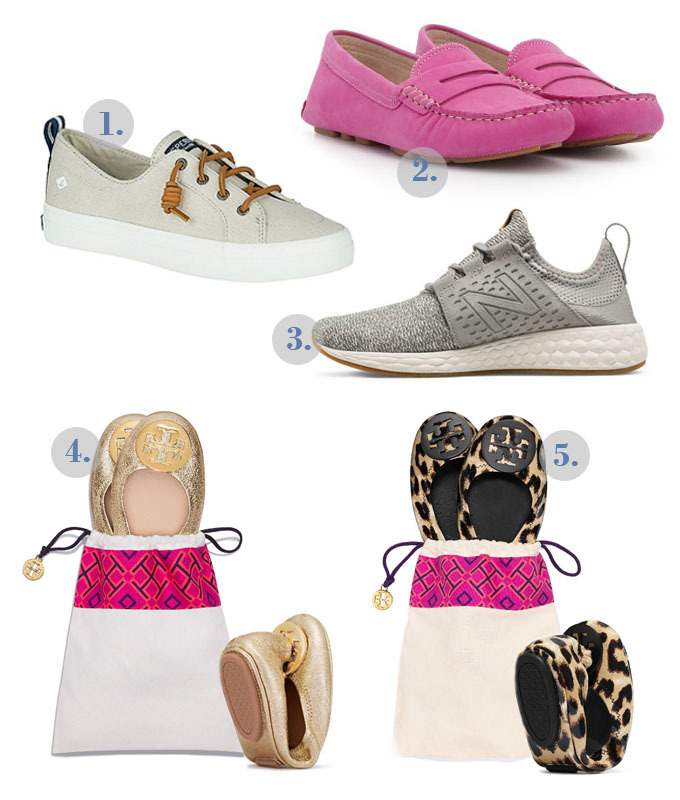 Both #4 and #5 are the Tory Burch packable flats. I'm never a huge fan of ballet flats because I find them uncomfortable, but I DO really like these. I also put these Dr. Scholl's inserts in them and they're even better! They take up virtually no space in your luggage, and again, can be dressed more casually or dressed up a bit. I wore the gold pair a lot in Italy last summer, and now that leopard print is the "it" print, I'm pretty sure those are next on my shopping list! I assumed folding them would ruin them/cause them to lose their shape, but they don't at all and they make packing almost too simple. The Sperry slip-ons (#1) and New Balance sneakers (#3) are both sneaker options, but they both pack VERY easily. The Sperry's are great to travel in - they form to your feet once you wear them a few times! - and the NB's can bend and be packed VERY simply without taking up too much space, as a lot of sneakers do. 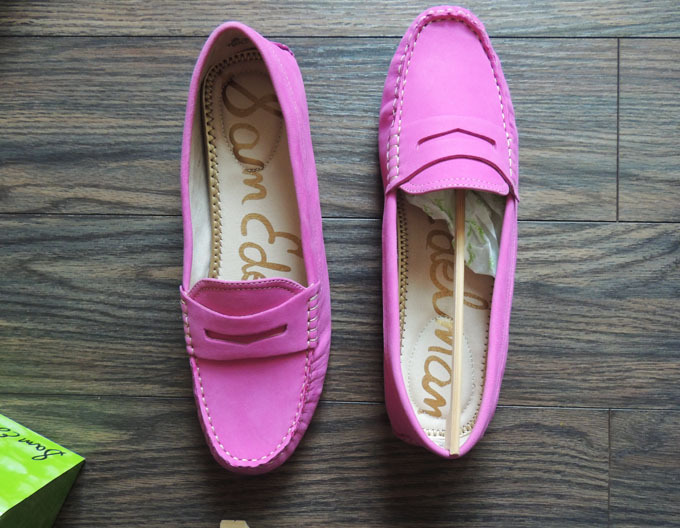 The same goes for these pink loafers; they're slim so they pack easily! ok girl these are all amazing! can you pack my shoes for me when i travel?! These are all great choices. 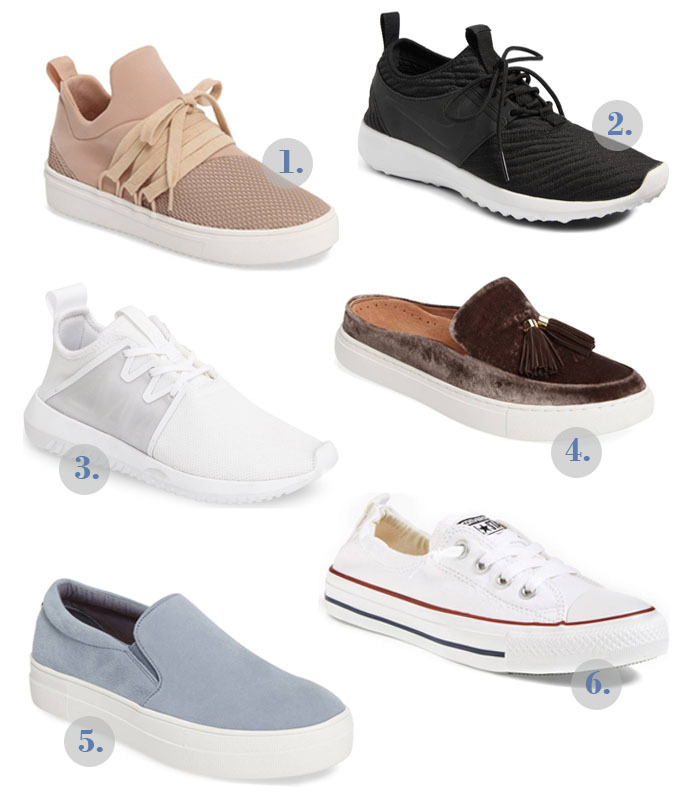 I need help finding the perfect comfortable casual shoe (but not sneaker) that I can wear with socks. Is it bad that I want every single pair!? I'm all for comfort and cute shoes! So many cute shoes! I try to limit myself to 2 pairs when traveling (one packed and one to wear on the plane). I just travel with a carry on, so space is limited! Some great picks!! If I'm traveling in warm months and know I'll be doing lots of walking, I have a pair of Clarks sandals that I always pack! I am always all about comfy shoes but especially when traveling. There is nothing worse than a blister to ruin a good day! I always wear my Birkenstocks when I travel! I'm also a huge fan of tennis shoes similar to #2 on your list! Loooove uggs! Also, those pink Sam Edelman shoes are soooo cute!! I am LOVING the 1st pair of sneakers, they are so darling!! Loving your choices! The Birkenstocks are so fun. I loveee my Birkenstocks- They feel so good on my feet! I've been dying to get a pair of Berks for years now - I need to take the plunge! Those flexible flats look like they were made for travelling. I'm about comfort no matter what the situation is so I find it ridiculous when I see girls posting photos from their travels wearing high heels. I love those Tory Burch flats! Whenever I travel I either wear my converse or birkenstocks. I agree with all of these options! Birkenstocks are my favorites for sure! and pack fluffy socks for the plane. I'm in cute shoe overload! 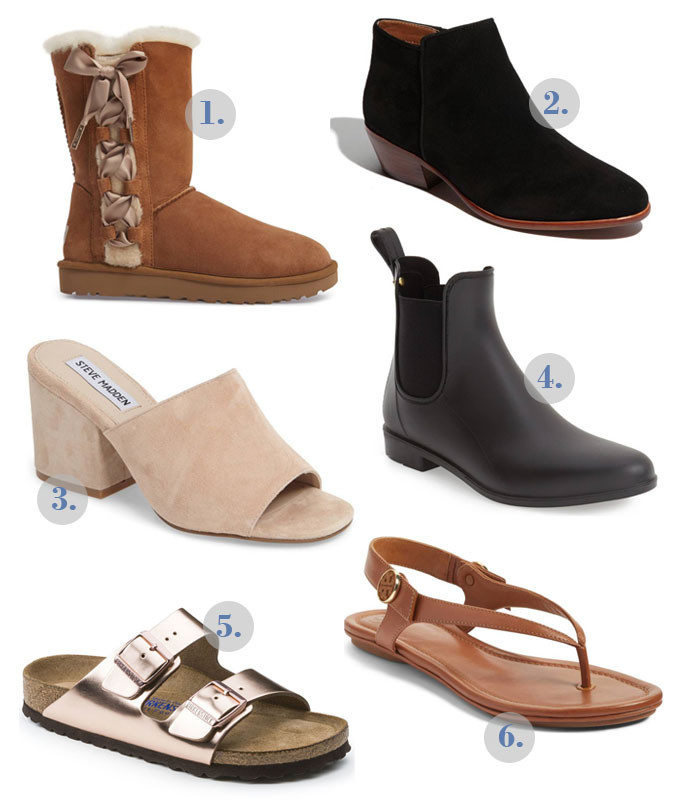 I especially love those Sam Edelman booties. I've been looking for something simple like that for far too long. I always wear an easy ballet flat! The leopard print ones are adorable. Such a great tips! I always have the hardest time packing shoes! A pair of legit Birks have been on my list forever - such classics! I have been debating getting Birkenstocks for what feels like the longest time! They are sooooo comfy when I tried them on, but not sure how much I'd actually wear them. Maybe one day I'll finally come around! Sooo many cute pairs of shoes!! All my friends have Birks and love them, but I've just never tried them! I definitely will have to now though!